March 16, 2017: At the 3/16 meeting, The MELA BoD met and discussed several topics including the preparation of future meetings, website maintenance and Bryce McHale scholarship. After lunch, the attending MELA membership listened to the presentation by the two scholarship recipients in 2017. Stephen Plont a senior attending MSU and John Goodin a junior from CMU. After that, newly appointed MDEQ Laboratory Director Kirby Shane discussed developments at the lab and future endeavors. Vapor Intrusion (VI) will be a discussed by the legislature. View the minutes by clicking here: here. Stephen Plont - MSU senior. March 19, 2015: At the 3/19 meeting, several topics were discussed. Meeting topics were formally adopted for the remaining dates this year. John Phillips updated the attendees on proposed changes in 40 CFR Part 136. George Krisztian and Carol Smith from the MDEQ came and discussed a variety of topics. 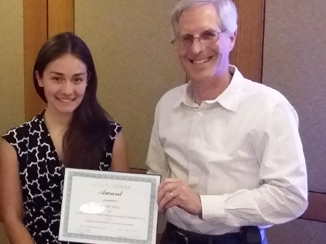 The 2015 Bryce McHale Scholarships were awarded. 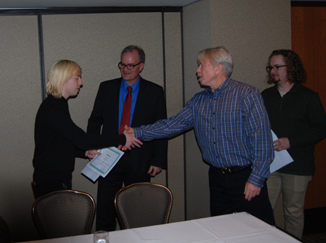 One recipient (Miranda Hengy) made a presentation. Meeting minutes can be viewed by clicking here. John Philips of Ford Motor Company presents the 2015 Bryce McHale scholarship to Miranda Hengy. April 6, 2014: At the 3/21 meeting of the MELA, a talk was given by Dr. Richard Rediske of the Annis Water Resources Institute at Grand Valley State University titled " The Implementation of Point of Use Water Treatment Systems in Developing Countries", an update was presented by George Krisztian and his staff at the MDEQ and Jasmine Stefansky of CMU was presented with the 2014 Bryce McHale Scholarship Award." December 7, 2013: The MELA website has been updated with 2014 meeting dates and the new Bryce McHale Scholarship webpage which can be found here. The new webpage includes information, application instructions, application form, and previous awardees. May 28, 2010: MELA re-launched its website with an exciting new look and layout, including a new website navigation system and interactive MELA Laboratory Locations map. 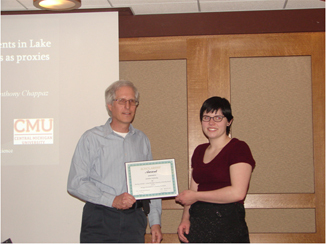 April 28, 2009: Pictured is the 2009 Bryce McHale-Michigan State University Memorial Fund award winner, Ms. Julia Smith. She is a junior at the Lyman Briggs Residential College for the Study of Science, on the campus of MSU. Her wildlife biology essay topic, Re-establishing the Cougar, an Apex Predator, East of the Mississippi, was selected by the MELA committee. 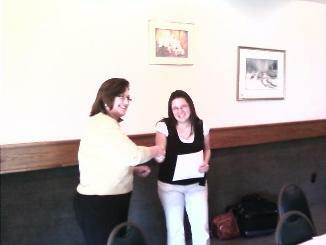 The photo is of MELA Chairperson, Gail Carr, presenting the $1,000 award to Julia at the April meeting. 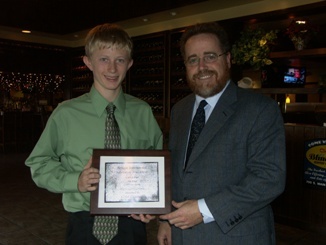 June 24, 2008: Cody Campbell, 15, of Attica, MI has received the Bryce McHale Memorial Award from the Michigan Environmental Lab Association (MELA). 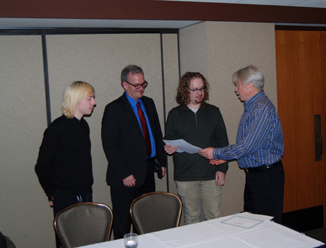 Kevin O'Mara, a MELA board member, presented Campbell with the award, a special plaque and $1,000 bond in Imlay City. The Imlay City High School sophomore earned accolades for his science fair project 'This Project Stinks!' which garnered a third place finish in the Flint Area Science Fair's senior division in March. Campbell's project analyzed the energy potential of animal manure for home heating purposes. The Association, which represents environmental testing laboratories from around the State, found Campbell's work very interesting and promising, O'Mara said. Campbell was chosen from dozens of other budding scientists from across Michigan. The latest award only adds to the winnings he took home in March from the Flint competition. Campbell earned a $1,000 scholarship and all expense paid trip to the Intel International Science and Engineering Fair in Indianapolis, Indiana. Cody is the son of Dan and Jill Campbell of Attica.